At the Aircraft Interiors Expo, the premier international exhibition for the aircraft interiors industry held in Hamburg, April 8-10, SABIC launched two new material innovations – clear LEXAN™ XHR sheet and LEXAN LIGHT F6L300 sheet – and exhibited a range of high-performance thermoplastic solutions that are helping aviation customers reduce weight and costs, enhance safety and sustainability, and optimize the flying experience. SABIC’s aerospace portfolio, including two new revolutionary LEXAN™ sheet solutions for aircraft interiors — are displayed on a small scale aircraft cabin model featuring applications using SABIC materials. There was overwhelming customer interest in the two new products: with 80% light transmission – the highest level of light transmission available in an OSU-compliant sheet material today – clear LEXAN XHR2000 sheet also meets typical industry flame, smoke, toxicity (FST) requirements (FAR25.853, BSS7239, ABD0031). The patent-pending LEXAN LIGHT F6L300 sheet is the lightest thermoplastic sheet option available today and also meets regulatory requirements. Design engineers will benefit from these lightweight, durable materials, which can help to reduce system costs and offer ease of fabrication. Both materials will help provide long awaited solutions to airlines’ quest for differentiated cabin interior designs while also helping to take out significant weight, resulting in more a fuel efficient aircraft. Booth visitors were able to see commercial applications of the new materials. Cabin dividers made with the clear LEXAN XHR2000 sheet; a magazine holder thermoformed out of LEXAN LIGHT F6L306 sheet by Zodiac Engineering Plastics, and an aircraft sidewall made with LEXAN LIGHT F6L306 sheet by Hagans Plastics were on display. 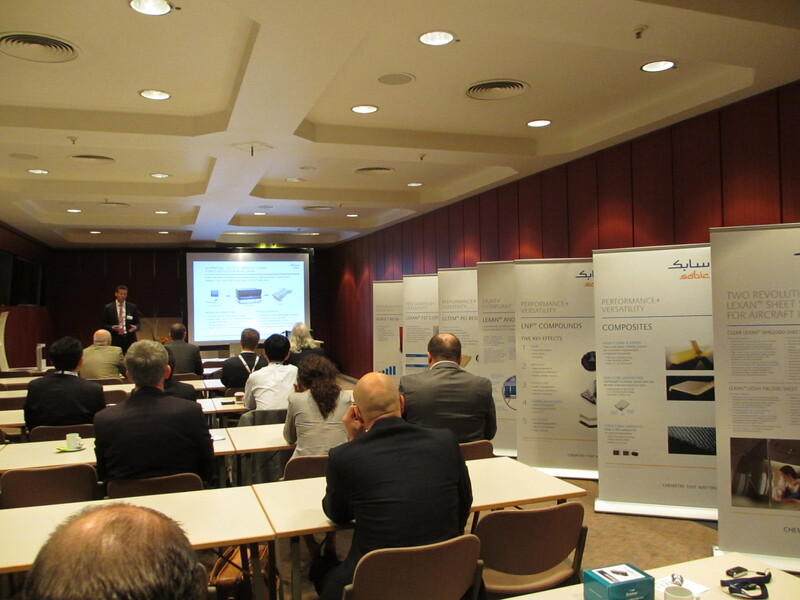 The SABIC team also held two days of well-attended customer seminars covering the two new products as well as aircraft seating and aircraft interior solutions. The seminars provided information about our relevant and compliant portfolio of resin, sheet, foam, fiber and composite materials and the technologies that are playing a key role in helping aircraft OEMs conserve fuel and lower emissions; meet increasingly stringent flame-smoke-toxicity (FST) regulations; and enhance the comfort, aesthetics and distinctiveness of the cabin environment. Each day, the team welcomed more than 50 customers to the booth, including the chief interior designer of Airbus and representatives from Singapore Airlines, Zodiac Aerospace and Sogerma. Numerous meetings were held with industry’s most influential members of the value chain, including Airbus, Zodiac Aerospace, BE Aerospace, Recaro, Diehl, ZIM, Sogerma and Pitch, generating more than 230 qualified leads. Many customers also attended luncheons that were hosted on both days. 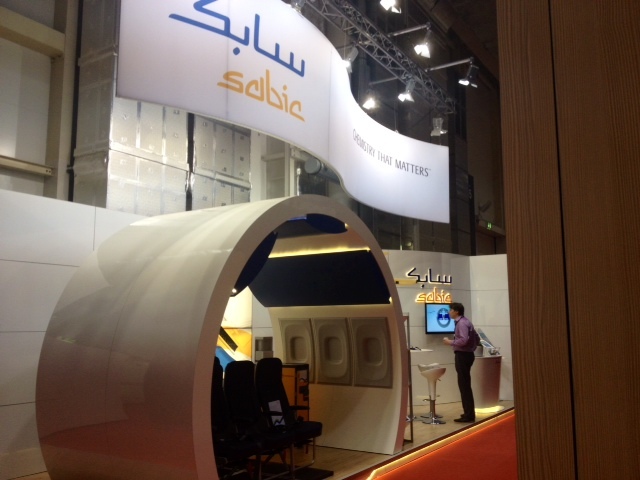 SABIC products were also on displayed at several of our customer’s booths. One highlight of the show was the Crystal Cabin Award-winning ZIM EC-00 seat, which received the award in the “Passenger Comfort Hardware” category. With a new, patented backrest concept, ZIM’s aircraft seat, using LEXAN™ XHR sheet, offers a new folding table structure, a new backrest, and an innovative connection between the backrest surface and the upholstery to make cleaning easier. During the event, Recaro launched their new business class seat, also featuring LEXAN XHR sheet. This important customer has given SABIC a 94% rating due to the high quality of materials and service that we provide to them. 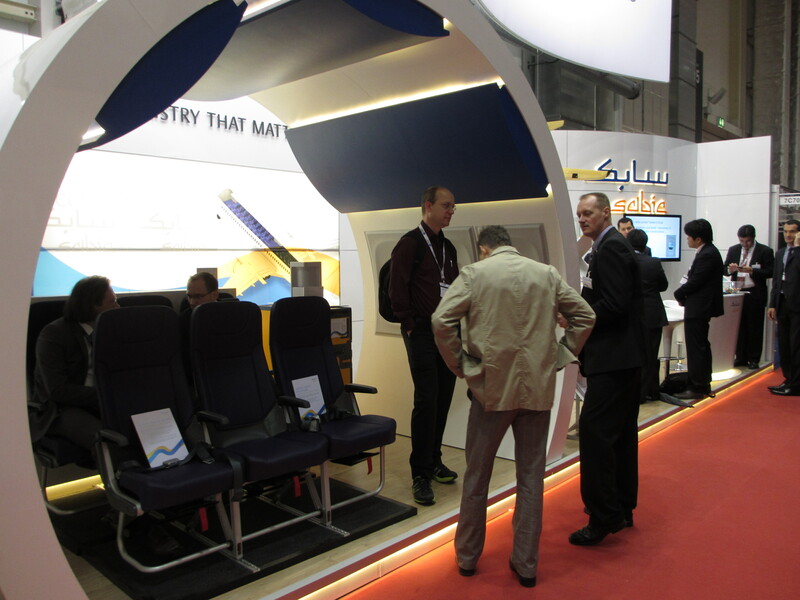 Aircraft Interiors Expo attendees visiting the SABIC booth also saw the Pitch Aircraft Seating PF2000, complete two rows of seating with innovative design features optimizing passenger space. The lightweight modular construction, which uses SABIC’s lightweight, FST and OSU 65/65 compliant LEXAN XHR sheet and ULTEM™ resin materials, allows airlines to select functionality and aesthetic options to better express their brands. The booth also featured the award-winning LSG Sky Chefs and Norduyn in-flight trolleys, certified as the lightest in the world. They incorporate UV-resistant ULTEMresin for the extrusion profiles and door latch, while ultra-tough NORYLTM resin replaces metal in the frame and other components. The weight-reducing design helps airlines improve fuel efficiency while enhancing durability and flame retardance. The ability to custom-color ULTEM resin allows Norduyn and LSG Sky Chefs to offer trolleys in the relevant airlines’ brand colors. Versatile, FST- and OSU-compliant ULTEM 9085 resin was showcased in a 3D plane model from Stratasys, fabricated using Stratasys’ patented Fused Deposition Modeling®, a direct digital manufacturing process (DDM). The 3d-printed model demonstrates how low-volume parts with complex geometries can be made quickly and cost-effectively. SABIC’s new super low gloss LEXAN XHR sheet, which delivers superior weight-out of up to 12% vs. traditional PVC/PMMA products, was showcased in cabin interior wall cladding. In addition, window shades made from multi-layer, opaque LEXAN XHR 5000 sheet which can eliminate unsightly carbon mark-off, were featured. SABIC also displayed a passenger service unit (PSU) engineered and supplied by PECO Manufacturing for the new Boeing 737 BSI using LEXAN FST and ULTEM resins. PECO used an integrated structural design which consolidated parts in order to reduce the footprint of the PSU. The use of ULTEM 9085 resin enabled thinner walls, resulting in a 30% smaller unit with considerable weight savings. On display at National Nonwovens booth, were multiple ULTEM resin fiber-based nonwoven solutions including fire-blockers, acoustic insulation, and FR wood paneling solutions for business jets. ULTEM based acoustic insulation was noted by NNW CEO, Anthony, to be successfully specified at Bombardier, Gulfstream, at the show for the Airbus A340 (the longest commercial airliner), US military helicopters, and in process for a potential across-the-board running change for all Boeing planes. Demonstrating 20% lighter weight, elimination of barrier films requires for prior NOMEX-based insulation, and with significantly lower water absorption ULTEM based non-woven solutions are enabling the next generation of technology improvements for hidden spaces.